For address and telephone, look here. My second mother, Cathy, was passing through northern California with her aimiable husband, Doug. They very generously invited me to join them for a few days in the Dry Creek and Russian River wine country of Sonoma County, a region about an hour to the northwest of Napa Valley. Fortunately, the weather cooled off before I drove to Cloverdale, a quiet little town about ten miles north of Healdsburg, the main city in the region. They rented a pale yellow Victorian house whose many large, broad windows let in oceans of light through the lace curtains. Right across the street was a tiny wooden church, painted light blue, with a bell tower. It looked as though it could accommodate a congregation of three worshippers and no more. And on Sunday morning, the three clangs of the bell — and no more — seemed to confirm that impression. Our first night, we ate dinner in Forestville, a half hour down Highway 101 and then west down River Road. 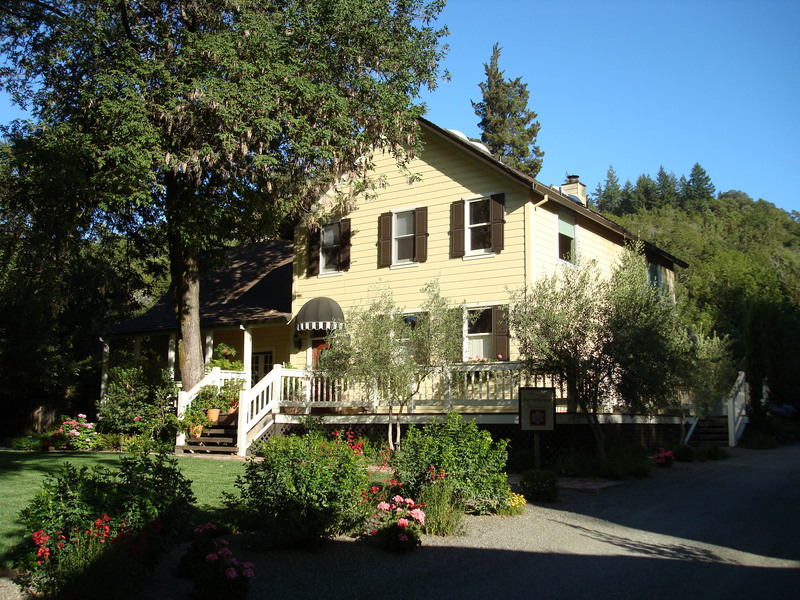 The Farmhouse Inn Restaurant is famous in northern California for preparing food that comes mostly from its own gardens. Their emphasis, no surprise, is on local ingredients. We entered a late afternoon light-filled room with five or six tables at comfortable distances from one another. I had the impression the room had once been a parlor, but I wasn’t sure the house was as old as I was meant to think it was. The staff was as warm, welcoming, and steadfastly attentive as the yellow and wood decor. I ordered three plates: American Buffalo Carpaccio with Chanterelles-Vinaigrette and baby lettuce leaves so small they might have been embryonic; Rabbit leg-thigh, loin wrapped in applewood-smoked bacon, and rack with a light whole-grain mustard sauce with roasted carrots and potatoes; Valrhona chocolate soufflé with crème anglaise. Of the three, the rabbit was by far the most delicious. The bacon-wrapped loin was a miracle of moisture. The carpaccio, too, satisfied me. The taste of buffalo stood out more for its freshness than for its distinct flavor. The vinaigrette as well as the teeny leaves accomplished what thinly sliced meat, oil & vinegar, and bitter greens are supposed to. The only disappointment was the soufflé, which I thought was insipid. Very little of what makes Valrhona chocolate special survived the cooking process. My eating companions enjoyed the meal, but thought that it did not compare with their meal at The Herb Farm north of Seattle. I thought I’d like to give the Farmhouse one more try. They handle fresh ingredients masterfully. Overall, I’d say this is an excellent restaurant.